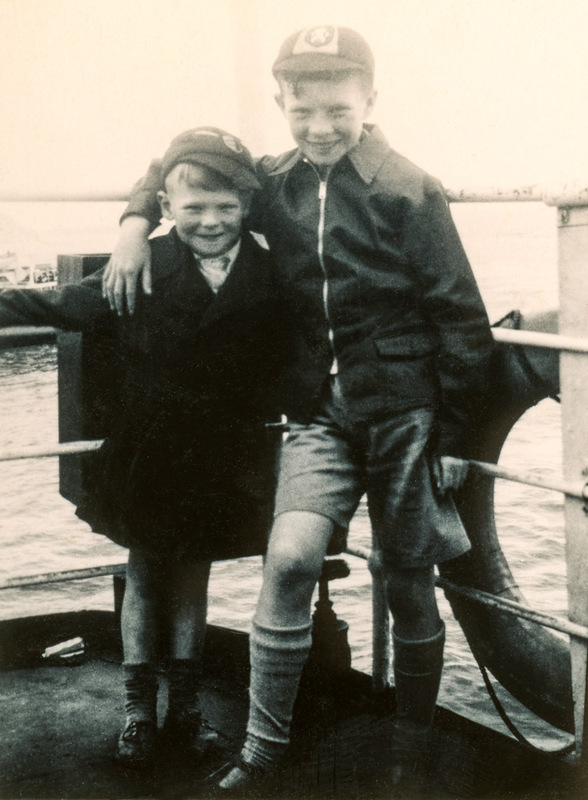 This photograph of my brother Roger and myself must have been taken as we were crossing the River Mersey by ferry on our way to our annual holidays in New Brighton. I must have been about four or five year old at the time and that would mean my brother was nine or ten. It will have been the summer of either 1952 or 1953. Such a long time ago! It is strange, the way the mind works when you see an old image. 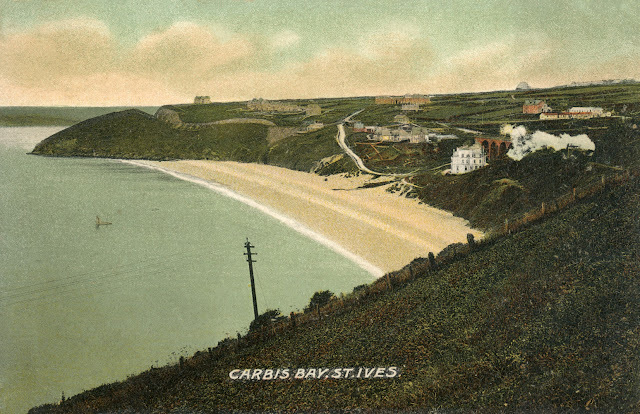 The thing that fascinated me about this old picture postcard of Carbis Bay, near St Ives in Cornwall, was not the stunning beach, nor was it the near-deserted landscape of a century ago: it was the telegraph pole! It makes no attempts to blend in, it takes no scenic prisoners; it's big and bold and boisterous, the way telegraph poles were always meant to be. Having seen it, I fell in love and found myself visiting the website of the Telegraph Pole Appreciation Society. I have to confess that I feel like I have been drifting recently: without purpose, without drive, without meaning. Could this old postcard be a sign for me? As I approach my eighth decade, could it be that the rigid discipline and spartan style of an unabashed wooden telegraph pole is just what my life needs? "There should be a name for it", a friend said yesterday as I was trying to explain to her what I found so fascinating about the scanning of old images. I had talked about how the process of digital scanning allows you to rediscover detail that has been hidden from view for decades, or even centuries. I had droned on about how it was like archeology, scraping away the surface to find history hidden beneath, and how it is often the most prosaic detail that sheds most light on the economic and social lives of previous generations. 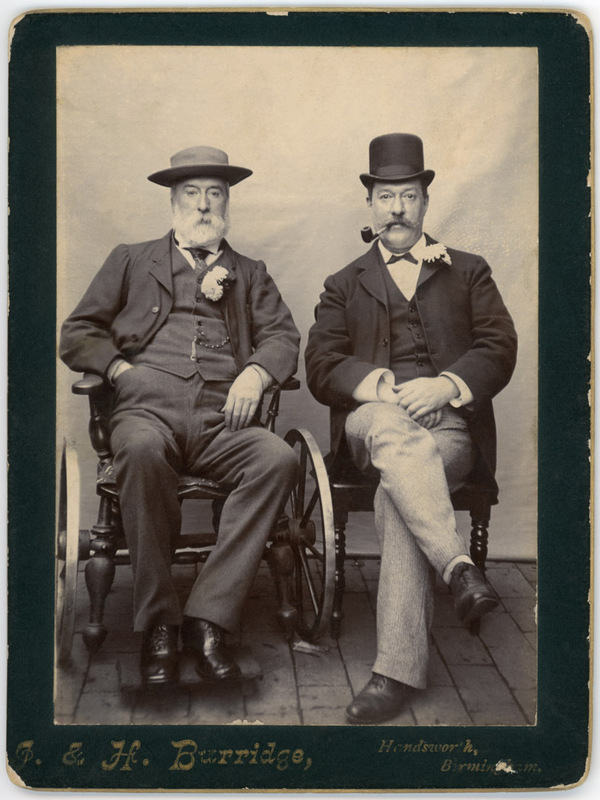 It doesn't matter who the people are, whether they are my great grandparents or someone else: it is the cut of their hats, the shape of their pipes or the nineteenth century design of a wheelchair, that - with the benefit of hindsight - is the most fascinating. She listened to my explanation and then said, "there should be a name for it". And she was quite right. For the last twenty-four hours I have been in search of that word. 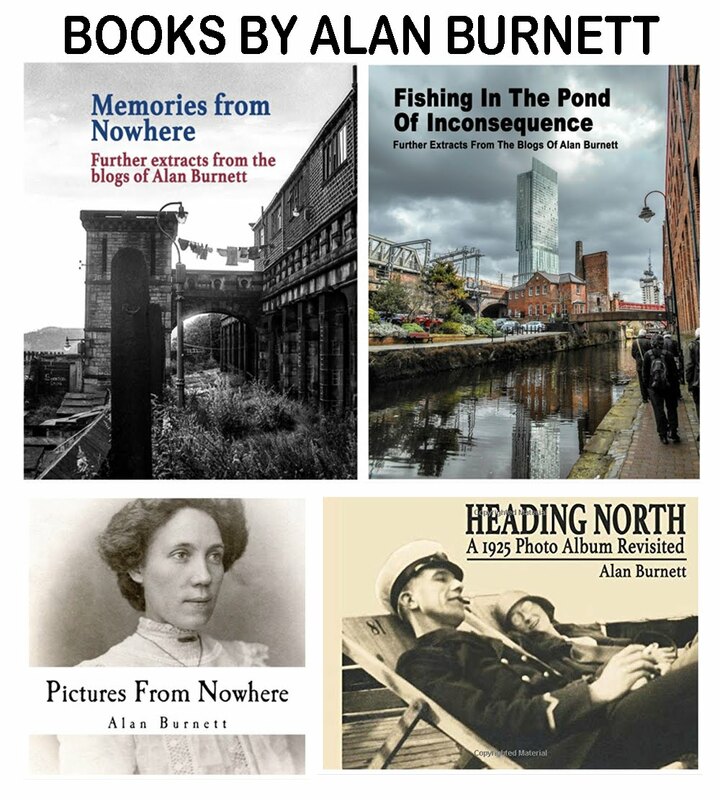 I started by checking to see if anyone had done all the hard work before me and come up with an acceptable term for this fascination with images as a vehicle for the delivery of insights into economic and social history. No snappy title had yet been coined as far as I could tell and the straight acronym (IVDIESH) seemed to have had all the charm sucked out of it. For a time I toyed with "Archeography" - which sounds good but falls short on etymological accuracy - and then moved on to "Archeoimagary" - which has already been stolen by those folk who study ancient paintings on rocks and cave walls (and you wouldn't want to annoy them by stealing their science). I quite like "Imagetory", and whilst there is already a #imagetory hashtag on Twitter, it only ever seems to have been used once. All this searching for words to describe this nascent science is, in reality, an anathema to us imagetorians: the age of the word has been proved bankrupt - we are seeing the dawning of the age of the image. So ignore all I have just said and concentrate on excavating this fine late Victorian portrait from the Birmingham studios of J and H Burridge of two fine looking gentlemen. 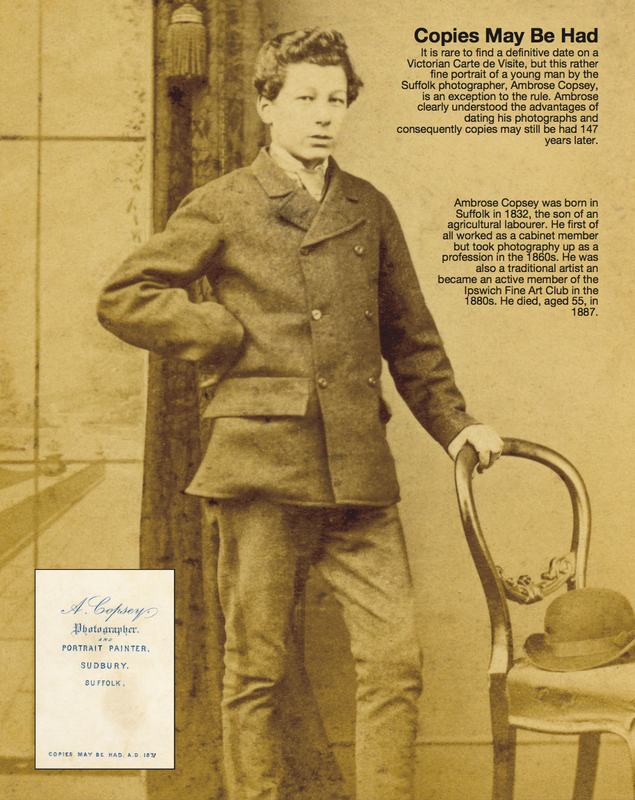 It is rare to find a definitive date on a Victorian Carte de Visite, but this rather fine portrait of a young man by the Suffolk photographer, Ambrose Copsey, is an exception to the rule. Ambrose clearly understood the advantages of dating his photographs and consequently copies may still be had 147 years later. Ambrose Copsey was born in Suffolk in 1832, the son of an agricultural labourer. 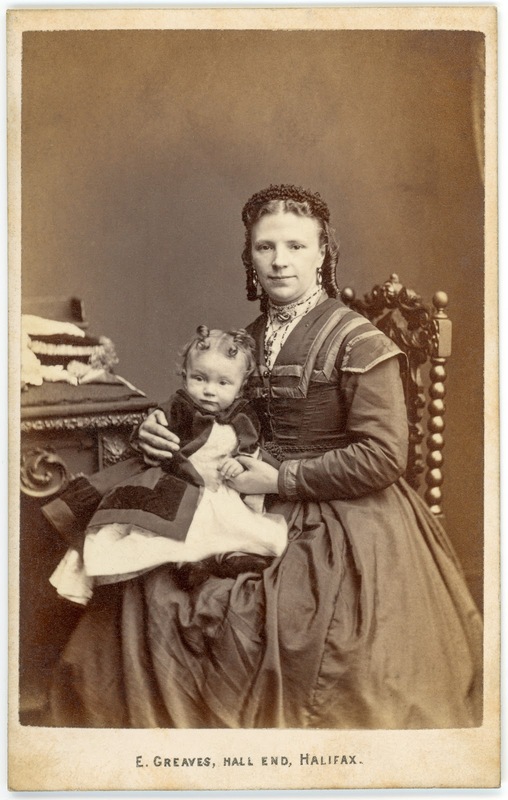 He first of all worked as a cabinet member but took photography up as a profession in the 1860s. He was also a traditional artist an became an active member of the Ipswich Fine Art Club in the 1880s. He died, aged 55, in 1887. 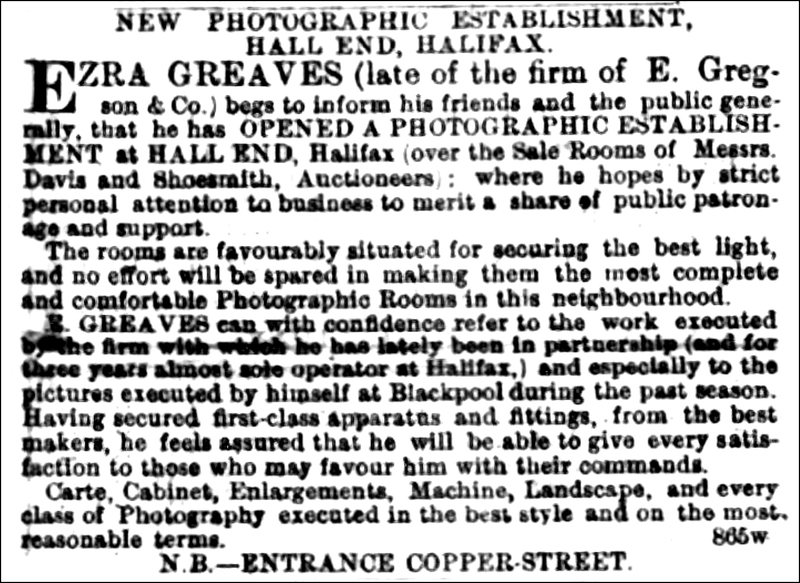 EZRA GREAVES (late of the firm of E Gregson & Co) begs to inform his friends and the public generally, that he has OPENED A PHOTOGRAPHIC ESTABLISHMENT at HALL END, Halifax (over the Sale Rooms of Messrs Davis and Shoesmith, Auctioneers : where he hopes by strict personal attention to business to merit a share of public patronage and support. 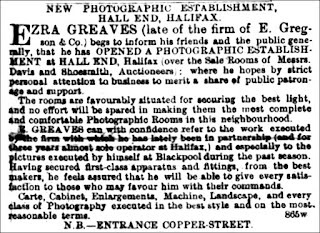 The rooms are favourably situated for securing the best light, and no effort will be spared in making them the most complete and comfortable Photographic Rooms in this neighbourhood.E GREAVES can with confidence refer to the work executed by the firm with which he has lately been in partnership (and for three years almost sole operator in Halifax) and especially to the pictures executed by himself at Blackpool during the past season. Having secured first-class apparatus and fittings, from the best makers, he feels assured that he will be able to give every satisfaction to those who may favour him with their commands. Carte, Cabinet, Enlargements, Machine, Landscape, and every class of Photography executed in the best style and on the most reasonable terms. 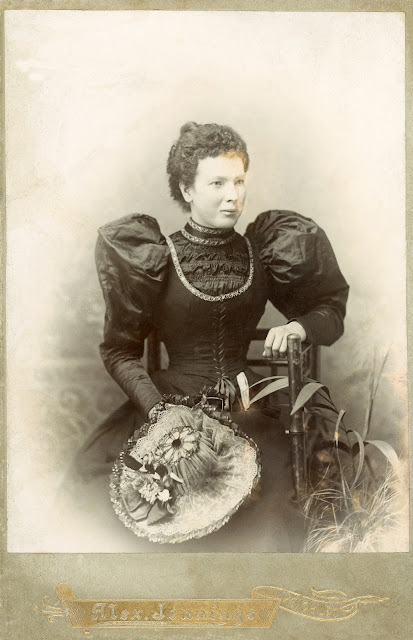 This picture of my grandmother, Catherine "Kate" Kellam, must have been taken in 1901 or 1902. At the time of the 1901 census she was living in Middlesborough, working as a waitress in a coffee house. 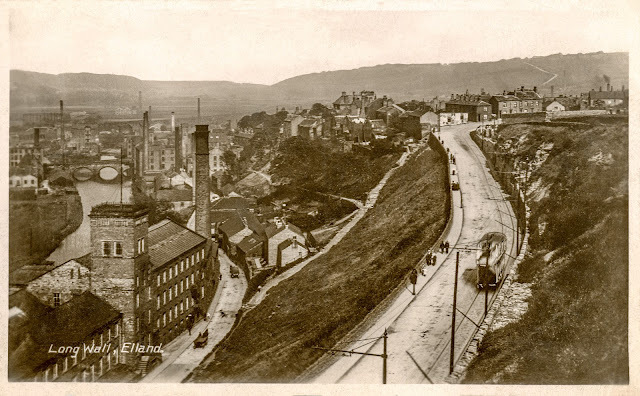 By April 1903 she had settled in Keighley and married my grandfather, Albert Beanland. As far as I can discover she moved to Keighley in the latter part of 1901 or 1902 and became a waitress in a local hotel. The portrait must date from this period - and the black formality of her clothing was probably influenced by the death of Queen Victoria in 1901. JOHN WHITEHOUSE who fell in his house and fractured his ankle. If this was just a small proportion of the people turning up at the Infirmary in 1868, the waiting room would have still been a lot less hectic than it is now. Nevertheless, I think I would prefer to take my chances with the queues and crowds (and antibiotics and anaesthetics) of 2018. Every photographer has a place they keep returning to, and a scene they keep retaking, in a quest for the definitive image they never quite find. 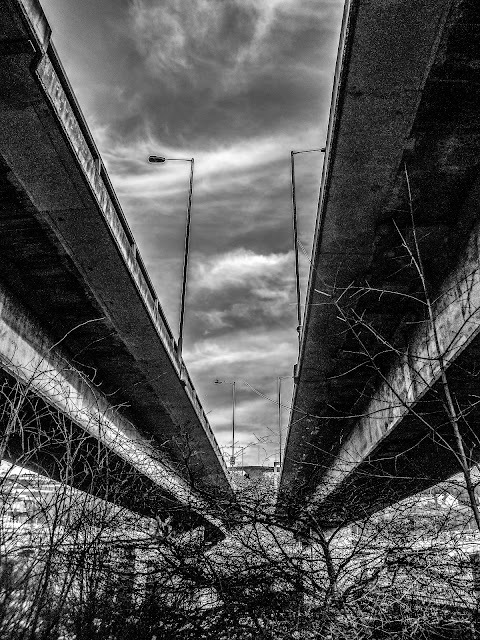 Mine is probably the Burdock Way Overpass in Halifax, which I first photographed when it was still under construction some fifty years ago. I still return every few months to visit it again, like a sad old artist revisiting a favourite model from times long gone by. 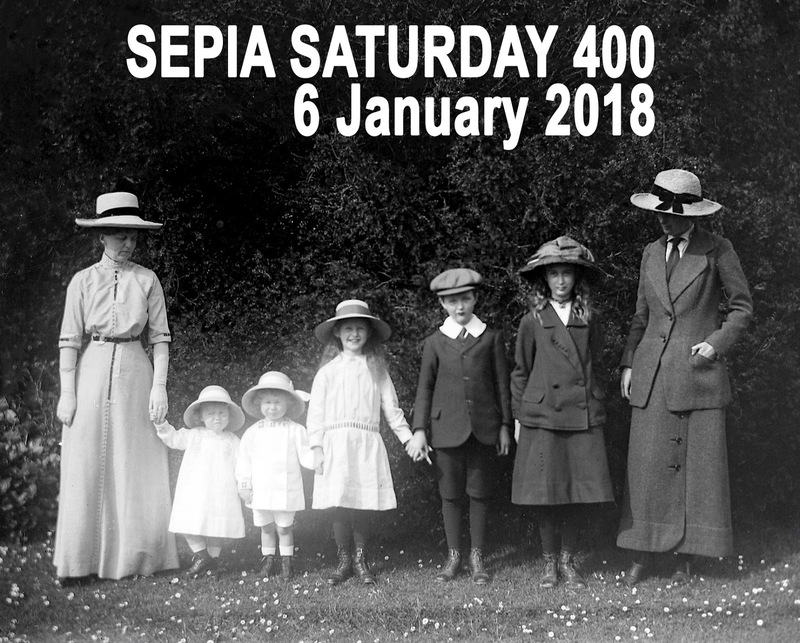 Our Sepia Saturday theme image this week features a 1914 photograph from the collection of the National Library of Ireland, of the Mote family all lined up in their spick and span splendour. My best efforts to match the theme image fall a little short: I don't know the family name, I don't know the date, they are not lined up and they challenge the description "spick and span". Nevertheless they look like a family and they have splendour in spades. The print this scan came from was given to me by a relative and passed it on to me because they had no idea of who it might be. So we will abandon the search for a name in order to concentrate on estimating a date. My best guess would be the late 1920s or early 1930s, and this is based on both the type of photograph and the dress styles of the participants. My first guess at the occupation of the father was that he might be a miner, but I am beginning to revise this in order to flirt with the idea of an agricultural worker. The cross-over collar the man is wearing should be a significant clue in identifying both date and occupation, but alas, my knowledge of clothing styles is limited. There is no excuse for such ignorance, and given the fact that I have nothing better to do with my life, I have just ordered an illustrated guide to dating photographs by, amongst other things, clothing styles. Hopefully this might provide some answers, and if it does, I will share them with you. I did make an attempt to line the family up more in the style of the Mote family, but somehow it didn't work very well (and, in what might be a surprise to the parents, I seem to have blessed them with another child!) This isn't a family to be lined up, ironed-out, in parade-ground order. This is a family that binds together, supports each other, whose lives overlap with dirty-dress and flat-cap informality. I still don't know who they are, but I think I prefer them to the Motes. 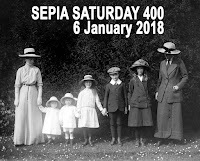 To see what others are doing with the Sepia Saturday theme this week, go to the Sepia Saturday Blog and follow the links. It's a wedding photograph, a 1920s photograph, a Bradford photograph. There is something very Bradford about it: a solidity and a sense of belonging: fine wool curtains set against leaded windows. Some of the subjects are easy to identify - that is my mother, Gladys, buried beneath the flowers on the right. 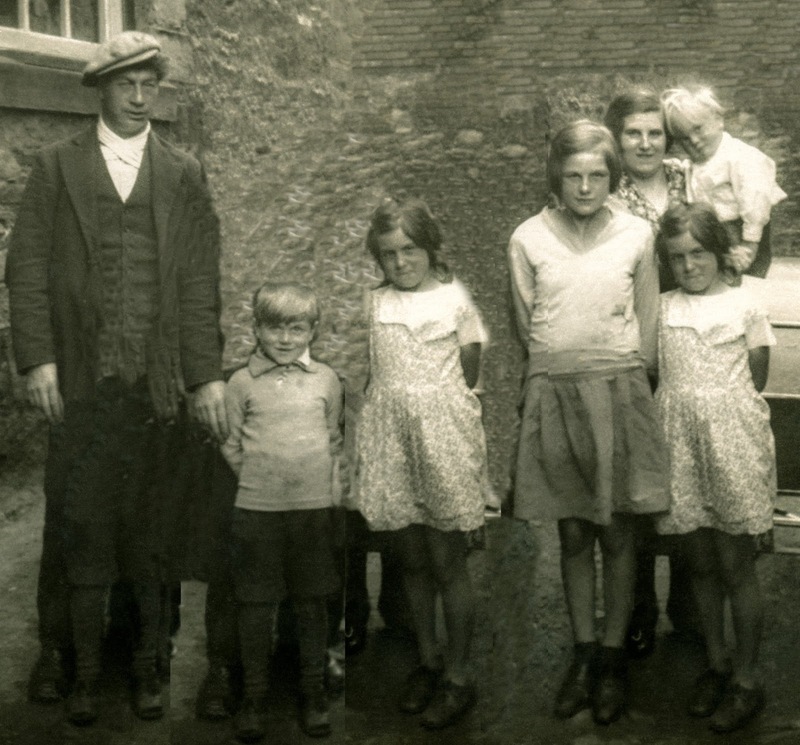 Her father, my grandfather, Albert Beanland stands next to her. The bridal couple are my aunt, Amy Beanland and her husband Wilf Sykes. The small girl between them is, I suspect, their niece, Una, although this is little more than a guess. The other two I am not sure about, but the man stood directly behind Wilf shares the same features and could well be one of his brothers (you get the choice between Arthur and Harry). The seated man on the far left looks far too smart to be a member of my family, so I suspect that the Best Man is in the picture. 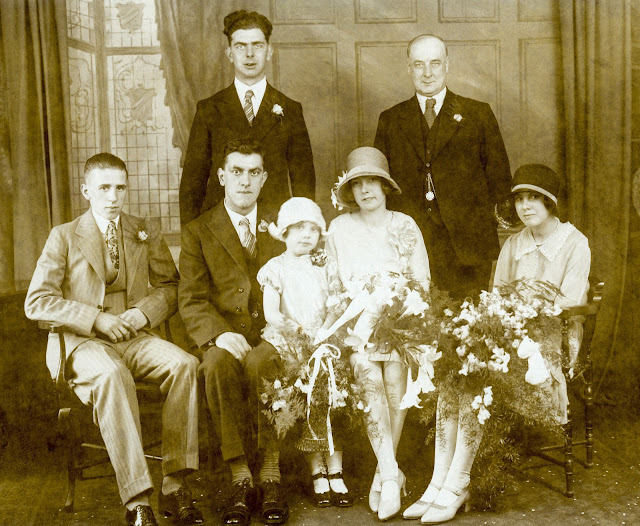 Amy and Wilf were married on the 10th August 1929, so my mother would have been just 18 when the photograph was taken. 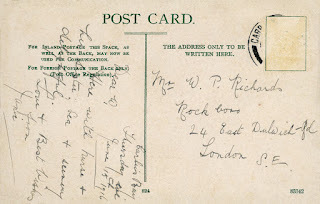 Wilf's father is missing from the photograph and although I know little about his family other than the fact that his father had been a police inspector, it maybe because he had died in 1921. I have found a death record for a Fred Sykes for 1921, but Sykes is a common name in these parts so it may not be the same one. 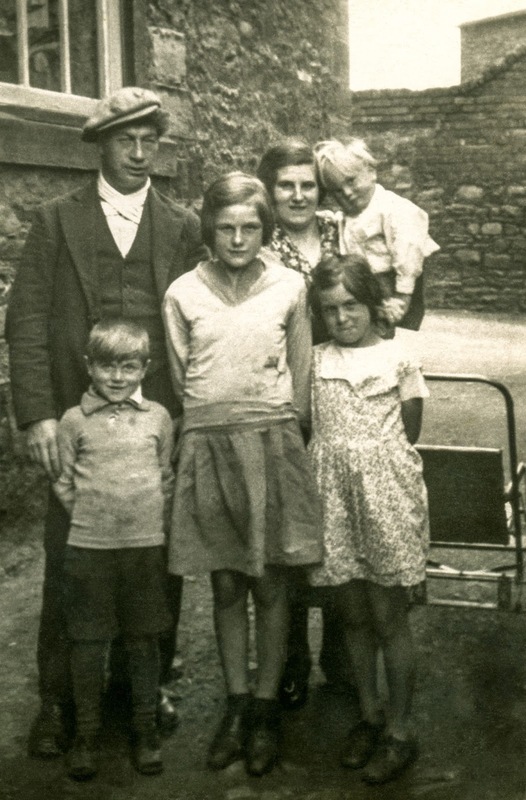 The 1911 census has police inspector Fred Sykes and his wife Ada, along with their four children, living at the Court House in Bingley. The property is recorded as consisting of "5 rooms & 3 cells", and on census night one of the cells was occupied by a certain "Henry Chester, Prisoner". 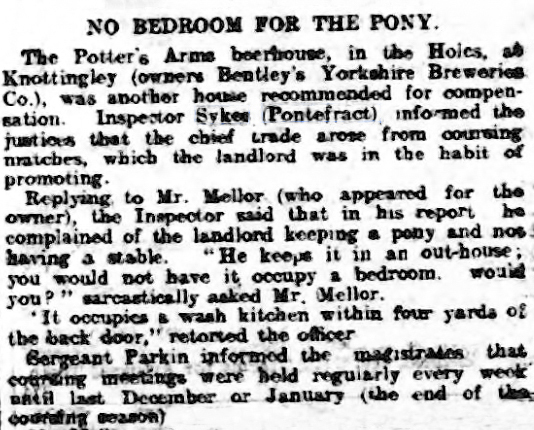 I am certain that Fred Sykes had a very long and honourable career in the police force, but the only public record of his service I have been able to find is a cutting from the Sheffield Daily Independent of Saturday 2 June 1906, when Inspector Sykes was based at Pontefract. The case concerned the renewal of a beer house licence for the Potter's Arms in Knottingley. 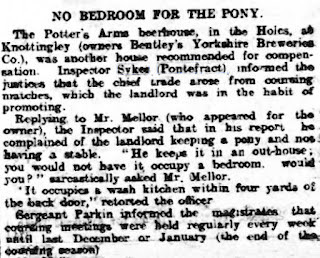 Opposing the renewal, Fred Sykes told the magistrates that the landlord had been keeping a pony in an out-house. The solicitor acting for the landlord couldn't see anything wrong with such an arrangement, "You would not have it occupy a bedroom would you? ", he replied. Tell Me Pretty Maiden Do, Are There Any More In Brighouse Like You? As always, a new year brings new resolutions, and promises to instil order and purpose in my life. As always, such resolutions have the life-span of an undernourished mayfly, so I might as well abandon them now, at midday on the 1st of January. As a consequence, if you detect any sense of purpose, any consistent theme, any meaningful undercurrent in my blog posts during the coming year, I assure you such things are not intended. With this in mind, let us jump aboard the illogical time machine and visit the theatre. I acquired this splendid old photograph of a local amateur operatic society from a second hand stall at a local antique fair. 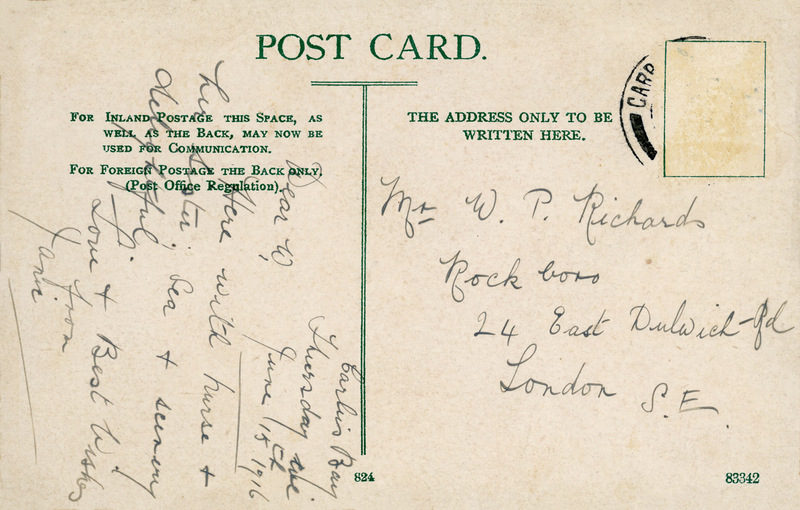 On the reverse is pencilled "Brighouse Amateurs, 1924, Flora Dora". There is an excellent little website devoted to the history of amateur theatre groups in the West Yorkshire town on Brighouse, and this includes a complete list of all the productions of the two amateur societies in the town, the Brighouse Light Opera Society (BLOS) and the Brighouse Amateur Operatic and Dramatic Society (BAODS). Both organisations were formed in 1923 and retained their separate entities until they merged - to form Brighouse Theatre Productions - in 2005. 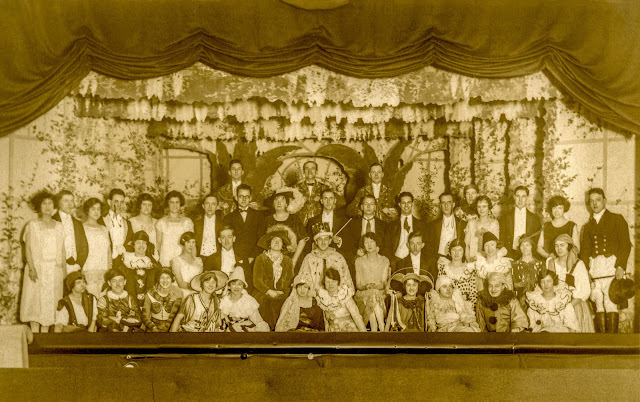 If indeed this is a photograph of the 1924 cast of Flora Dora, that means it is the Light Operatic Society, as the BAODS were performing The Mikado that year. The real joy of the photograph is the undiluted enthusiasm that fairly radiates from each and every member of the cast. This is local people sharing their talents and entertaining each other in a world far removed from box sets and video streams. In saying this, I am not paddling in the sickly still waters of nostalgia for a time long gone, the Brighouse Theatre Productions website proudly announces that they will be putting on a run of Sleeping Beauty at the local Civic Hall later this month. I will certainly try to make sure I attend, and perhaps even capture a picture of the complete cast at the end of the performance. Until then I will soak up the energy and enthusiasm from those sepia faces of 94 years ago whilst humming along to one of the greatest hits from Flora Dora, "Tell Me Pretty Maiden".